Observation - Red-shouldered Hawk - Global. Description: Young of the year, on multi-year nest in a beech tree. Green hemlock twigs decorate the nest (lower right) - a usual habit for these hawks. Young of the year, on multi-year nest in a beech tree. 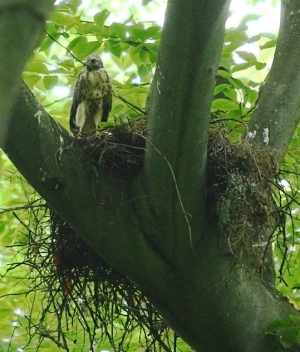 Green hemlock twigs decorate the nest (lower right) - a usual habit for these hawks.